West Indies star Dwayne Bravo has taken 400 wickets as the only player in the history of the recognized T20. Bravo was 400km away from 400 wickets before the Big Bash match between Hobart Hurricane and the Melbourne Renegades on Thursday. 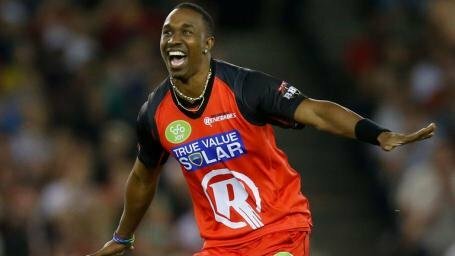 Bravo scored 5 for 28 against Hobart Hurricane for Melbourne Renegades in a great bowling, with 5 wickets. Bravo took two wickets in his first three overs this time. After that, the fourth in the fourth over of the innings and the one-off Zafarra Archer, Cameron's age and Matthew Wade took 400 wickets out. The recognized T-20 second highest wicket-taker Lasith Malinga is far behind than Bravo. Sri Lanka pacer has 331 wickets Bravo's Swadeshi Sunny Narin with 307 wickets is at number three. Bangladeshi star player Shakib Al Hasan is at number four with 292 wickets. This is very good news for Bravo.